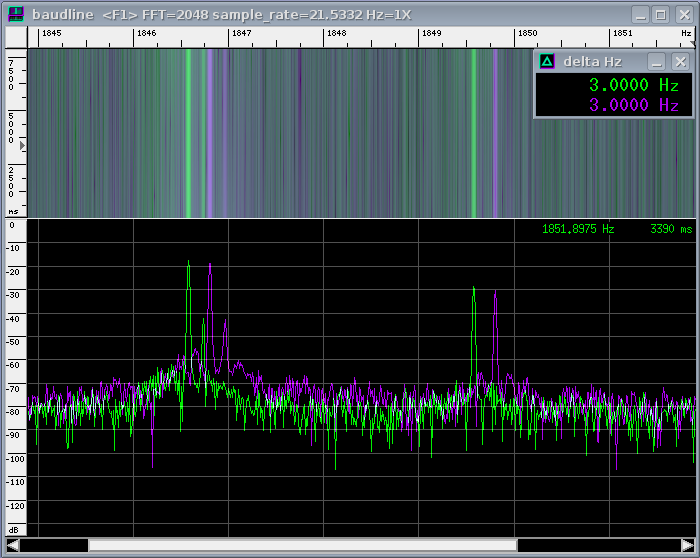 This is s screen shot of the Baudline spectrum analysis software displaying the audio output from a pair of HP 3586C Selective Voltmeters tuned to 5.000 000 3 MHz. Each receiver is shown in its own color on the plot. What's of interest is that though there is an offset of about 0.2 Hertz between the two receivers, the frequency difference between the two signal peaks on each channel is identical. In theory, this marker signal should be at precisely 1850.0 Hertz, but because the BFO that's part of the audio circuit uses a crystal that is not locked to the external reference, it is not quite where it's supposed to be. In this case, receiver A's BFO is about 0.4 Hertz low, while recevier B's is about 0.2 Hertz low. However, once the receiver has warmed up, the BFO crystal is extremely stable, so with proper measurement technique its offset is not an issue. The signal a bit below 1847 Hertz is the WWV carrier at 5 MHz. Note the small spur just about the carrier; that is some sort of interference that I haven't yet tracked down. Note that which sideband you are using affects the math -- if the receiver is set to USB (its power-on default), you subtract the unknown from the marker. In LSB, you subtract the marker from the unknown. Getting this math wrong will result in an error of twice the delta frequency, as I discovered to my sorrow in the 2006 ARRL Frequency Measuring Test.